The question usually answers itself. If you are a homeowner and you have treesin your yard that should be trimmed or removed then it is going to be best to hire a professional company that trims or removes trees every day. The most obvious reason to hire a professional is safety. A professional tree services company knows that safety comes first. Many homeowners look at a tree and think I can handle this. They may not take into consideration which direction the tree is going to fall, or once you get up in a tree what if the branches are rotted? If you step out onto one of those you are certain to go down. The right equipment for the job. If you have a chainsaw you may think that’s all I am going to need for this job. However like many tasks, the right equipment makes a job safe. Many tree trimming and tree removal companies keep many different types of saws, ropes, cleats etc available depending on the size and scope of the project. Properly sharpened saws can make for a quick and safe cut while saw blades that are dull or rusty can create hazards and dangers for someone trying to trim or remove large branches. Some standard tools that a professional tree removal Services Company may use, may include chainsaws, climbing hardware, ladders, carabineers and more. These tools have to be kept up and maintained for safety. More reasons to hire a professional tree trimmer or tree Removal Company. Prevent damage to your home. Knowing how to fell a tree in case of removal takes a lot of experience. Trees can look like they will naturally fall one way and at the last minute when that critical cut is placed they can go a whole different direction. The last thing you want when trying to drop a tree is having the tree fall into a home or building causing damage. Get the Job done right. Hiring a tree services professional can give a homeowner a piece of mind. Professional companies will take the time to explain how they are going to approach the job. In the case of trimming they will point out which branches will come down and the benefits to every cut. A professional wants all those concerned to know what to expect during the tree trimming or removal process. If you live in the Twin Cities Minneapolis St Paul area and you are in need of a tree trimming or tree removal company contact Ivans Tree Services. 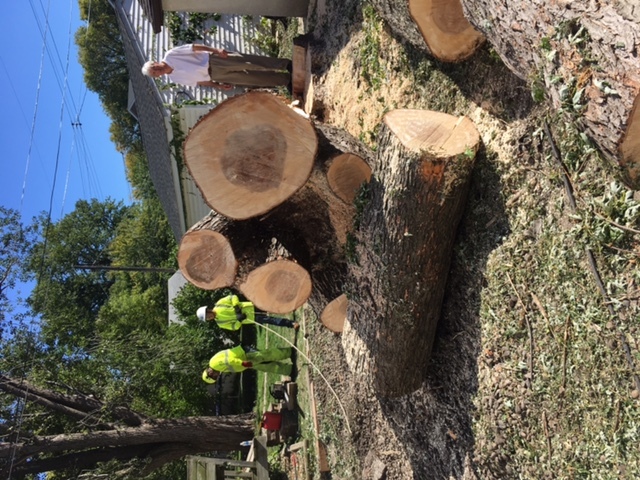 Professional tree trimming and removal company in Mpls. St Paul. Over 25 years of experience dealing with power lines and trees close to homes and buildings.